Net Element International Inc (NASDAQ:NETE) surges on product release. NETE has been posting huge improvements year-over-year in terms of revenue growth. This should continue with its announcement below of its new product release. NETE has been in consolidation mode since the beginning of the year after surging towards the end of last year. The stock price has been fairly steady hovering around $0.20 for the last three months, building solid base. Over the last few days, NETE has been advancing on large volume. The stock has climbed almost 50% in the last few trading days. The stock closed at $0.285 with a daily gain of 24%. In recent developments, NETE released its point of sale product solution for retail stores. This solution is a cloud-based product that is available on Apple IOS platform and allows retailers to focus on their business and deliver an exceptional instore experience to customers. The new POS system allows retailers to predict customer needs, track purchasing habits, inventory management, and reduce wait times for customers. Retailers are able to customize Aptito Retail POS based on their environment. Peripherals for Aptito Retail POS include a fully integrated cash drawer, thermal receipt printer, barcode scanner, barcode printer and EMV-compliant point of sale acceptance terminal. This allows retailers the ability to customize their POS solution based on their unique needs. NETE has a 52-week high of $1.42 and has advanced from its $0.05 low. The stock has gained over 500% since setting a 52-week rewarding investors who took the risk to invest at these low levels. 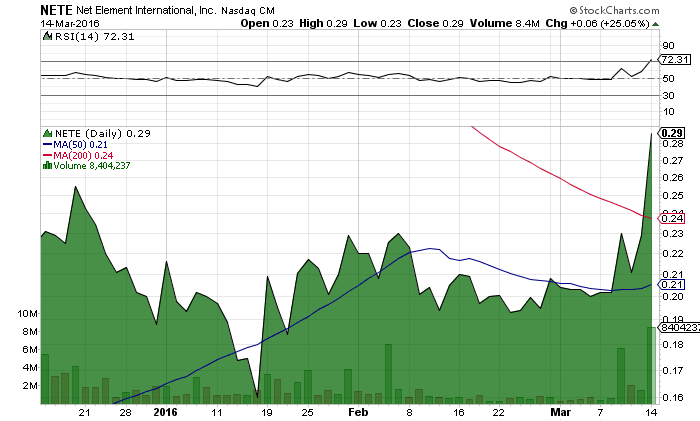 NETE has surged past its 200 daily moving average of $0.24 and its 50 day moving average of $0.21. Both are beginning to shows signs of slopping upwards which is bullish for the stock. NETE is a technology company specializing in mobile payments and value-added transactional services. The company owns and operates a global mobile payments and transactional processing provider, TOT Group. TOT Group companies include Unified Payments, recognized by Inc. Magazine as the #1 Fastest Growing Company in America in 2012, Aptito, a next generation cloud-based point of sale payments platform and TOT Money, a leading provider of SMS messaging and mobile billing solutions. NETE is currently trading at a $26 million market valuation. NETE has surged on increasingly large volume and has been rallying since hitting its 52-week low. With recent developments of its new product release for retailers should provide a boost to revenues even more for the company. Stay tuned as NETE is just starting its turnaround story. We will be updating on NETE when more details emerge so make sure you are subscribed to Microcapspot so you know what’s going on with NETE. Disclosure: we hold no position in NETE either long or short and we have not been compensated for this article.